It’s universally acknowledged that bees are in trouble. Before you leave, thinking that it’s not really a concern to you, consider this. Approximately one third of the food we eat is pollinated by bees. So, if you’re fortunate enough to have a nourishing and varied diet, then bees are of extreme importance to you. Not to mention that alfalfa, a major crop fed to cattle, is also pollinated by bees. So, even if you’ve never willingly eaten a vegetable (I’m looking at my husband here) then bees are still vitally important. Why are the bees in trouble? There are various contributory factors and you might have heard of Colony Collapse Disorder, where no one reason seems to be the cause but one of the major reasons they are dying is because of the use of pesticides. It’s been recognised that a group of particularly powerful pesticides, neonicotinoids (neonics), are at the heart of why the bees are disappearing. Using new technology, neonics penetrate the plant and attack the nervous system of insects that feed of them – posing a deadly threat to all pollinators. These pesticides have been banned in other countries already. The French banned neonics in 2000 after concluding through their extensive studies, that even small doses of these pesticides disoriented bees and impaired their foraging ability. Italy, Germany, Slovenia followed suit and banned sales of two varieties of neonics. DDT is a chemical pesticide that was used widely across Britain, Europe and the US – until it was shown to have chronic effects on the nervous system, liver, kidneys and immune system. It was banned in Britain in 1984. Neonicitinoids are 7,000 times more toxic than DDT. Yet they are still being used. If we lost the bee population, The British Beekeepers Association estimated that it would take a workforce of 30 million people just in the UK to do the pollination by hand. This isn’t a joke. In Southern Sechuan, China, the pollination has to be done by hand as, due to overuse of pesticides, the local bee population died out. Have I persuaded you that this is important yet? I hope so. So, onto practical action now. What can you do? There are various ways you can get involved, thanks to the Neal’s Yard Remedies Bee Lovely Campaign. You can sign this petition about the use of Neonicitinoids from Neal’s Yard Remedies. 100,000 signatures are needed before it can be taken to Parliament. If you go into your local Neal’s Yard Remedies store, there are wild flower seeds (from Land Life) and a ‘Bee Lovely and Help Save The Bees’ booklet available for you to take away. These lovely resources will help you to make better choices in your own garden and help support your local bee population. You can buy a gorgeous and limited edition Bee Lovely handcream from Neal’s Yard Remedies too – with a blend of organic honey, brazil nut oil and beautiful orange essential oil, not only will a percentage of the cost be donated to the charities below but your hands will thank you too! You can make different choices in your garden, choose pollinating plants and flowers, leave places for bee habitat instead of being super-tidy and garden organically instead of using pesticides. Bug Life, who are running projects to support the 250 different pollinating insects threatened with extinction. Pesticide Action Network, who will be creating a bee microsite on their website, which will be a one-stop-shop for anyone searching for information about pesticides and their effects on pollinating insects. From today, I am starting my own ‘Margot and Barbara Bee Project‘. Last year I did a day of bee-keeping, and it was superb. This is the next stage! As an inital step, I will be signing the petition above and adding my name to the list of people who think that these pesticides should be banned. 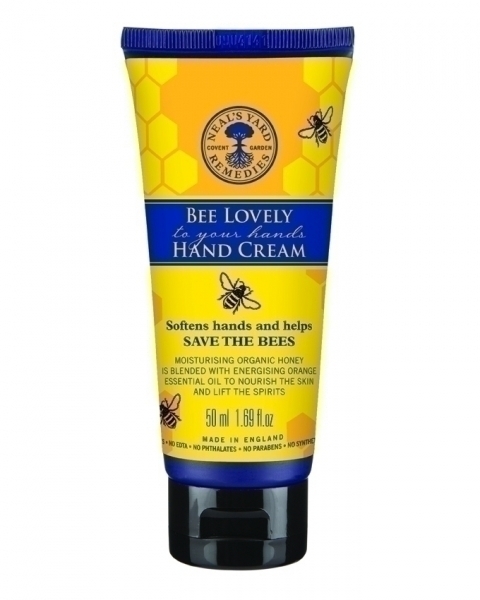 I’m going to treat myself to a tube of Bee Lovely hand cream. I’ll share my review with you here too. I am going to turn over a portion of my allotment to flowers that are recognised as being good for bees. Although the bees will benefit, they in turn will pollinate my crops so I will benefit too! I am also going to turn a chunk of my allotment into a wild flower area. By planting native British wildflowers from a reputable source (such as Land Life or Wiggly Wigglers) biodiversity, and therefore bumble bees, can be encouraged. Again, they will also help to pollinate my crops. I’ll be doing a series of Bee Project posts, which will hopefully be useful and informative and perhaps persuade a few of you to join me? Look out for more blog posts about my Bee Project and I do hope that you will also support the Neal’s Yard Remedies Bee Lovely Campaign. It really is vitally important. Hello! So lovely to have you here, and thank you for this giant and fabulous comment! I’m thinking of lavender and borage too, I love the idea of plants that are beneficial to us but also will attract pollinators. You’ll have to get a bee chart from the Bumblebee Conservation Trust to work out which kind of bees come back this year! I’m going to make my wild flower patch underneath my apple trees I think, so that it’s not taking up lots of space (and therefore irritating ‘traditional’ allotment holders, and will make use of space that’s effectively redundant at the moment. Lots to do! Rome: Moses Fountain Hotel review.